No, this isn’t a Teaching Song moment. Although I try to keep this blog focused on creative things, occasionally life intrudes. In this case – intrudes in a big way. The Resident Male has accepted a company posting in Pune, India. He leaves this afternoon for a two-year stint. I and Younger Daughter will follow him after the holiday season. She will be finishing 9th grade over there. Elder Daughter will continue on to her senior year of college, and we’ll all be back for her graduation in the spring. After that plans get hazy, but some or all of us will be resident over there with him until he returns. What does this mean for String? You’re looking at it. Ease of remote maintenance and pre-trip streamlining were two of the reasons for the big port we just completed. I intend to keep on stitching and knitting, posting about it from here or Pune as circumstances dictate. 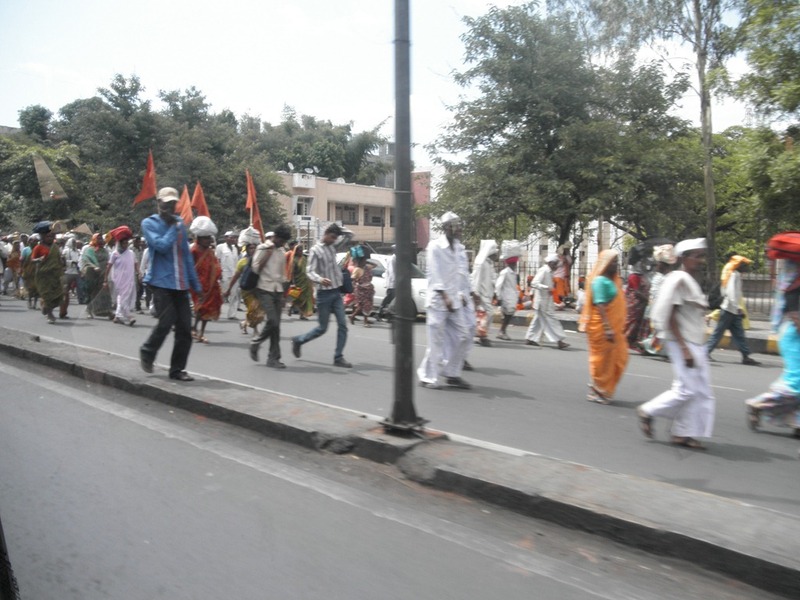 What’s Pune like? I did accompany him on a whirlwind one week house hunting trip there earlier this summer. Most of what I can report is massive sensory overload. It’s a trip to another world, as surely as any interplanetary trip from a Jack Vance novel. I’ve always wanted a Grand Adventure, and now I’m really looking forward to having one. I can say that Pune is largely part of New India, the India that has so avidly embraced a high-tech economy. It’s a city in the hilly region about a three hour drive east and a bit south of Mumbai. Like Mumbai is part of the state of Maharashtra. Pune is known for its industry (especially automotive), technology companies, universities and teaching hospitals. In the latter three, it thinks of itself as the Oxford (or Boston) of India. 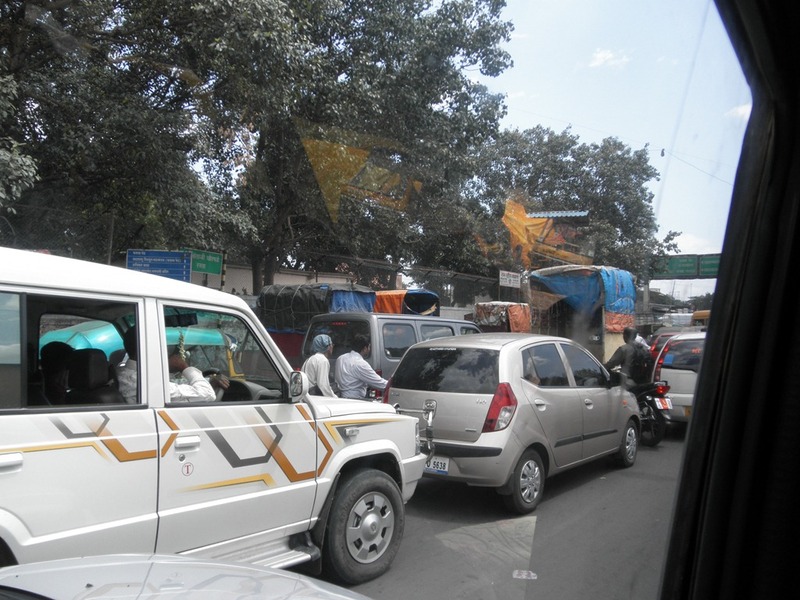 Like most of urban India, it’s crowded and noisy, especially by US standards, but it’s also vibrant and very welcoming. While we were there we did find an apartment. Touring the possibilities was more like speed-dating for housing than a considered quest. We looked at lovely stand-alone bungalows, full of quirky romance and surrounded by lush gardens. But when amenities were considered, reason overcame romance and we selected a modern flat. Here’s the view from our balcony-to-be. 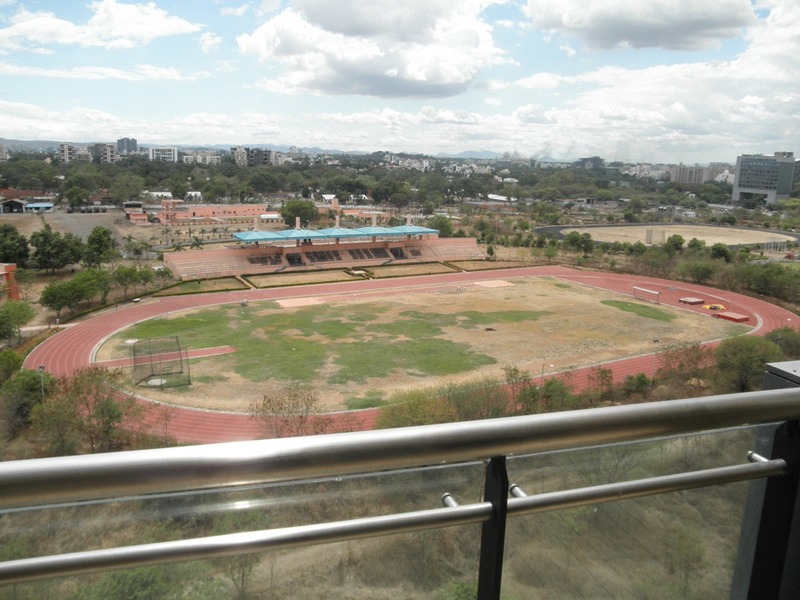 It’s in the Koregaon Park Extension neighborhood, overlooking a military athletic facility where many members of the Indian Olympic Team train. It’s quiet, with privacy – no road noise intrudes because the back of the apartment complex abuts the military reserve, and there’s no neighbor across the way to peer into our windows. So there it is. The Resident Male has gone away, gone ahead to pave the way. I continue to prepare, and will follow, to whatever adventure awaits. (Extra points to those who know the origin of this post’s title). How exciting! This will be a great experience! I look forward to reading about your experiences in Pune! I took part in your blackwork crowd sourcing project… many moons ago. I did the anchor and the beetle. Then life got in the way but I am glad to have found your new journal! Excellent! Welcome to the new spot. All content including the crowd source project is here. If I see some stitching pix using your motifs, I’ll send them your way. I know I get a big kick out of seeing what mischief the “pattern children” get up to out in the wide world. On India – we’ve got a few months to go before we head over. I’m looking forward to meeting up with some knitting and stitching pen pals over there, and will be posting about what we find.